I've been a software developer for over 20 years and, in 2008, released my first iOS app called Hiqup. Since then I've been developing for iOS (and recently made the move to cross-platform development to encompass Android) and in 2011 released Arthur & Charles Present Create & Play. In late 2011 I started talking to the very talented comic writer and artist Jamie Smart about producing a point and click adventure game (this came well before the Double Fine Kickstarter project!). 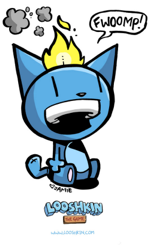 One thing quickly led to another and we soon realised that one of his existing characters, a very unhinged cat called Looshkin, would be the perfect subject matter. Looshkin The Game is a very long term project, a labour of love that will most likely not see a release until well into 2013. We have already gone through some preliminary tests: constructing rooms, walk cycles etc. The the bare-bones engine behind the game has already taken shape, but with the plans we have in store for the game, there's a mountain of work to get through. To keep up to date with the Looshkin development work, please visit the separate blog at http://www.looshkin.com/. For several years I have been working on a pair of characters called Arthur & Charles. In early 2011 I decided that I had to do something with them, and creating an app was the perfect vehicle to do so. Create & Play revolves around a face creator that allows you to create billions upon billions of unique faces using hundreds of facial features and a comprehensive colour palette to colour those individual pieces. Faces can be saved in the app or shared by saving them to your device's photo library or emailing them to yourself or friends. But that's just the start, the faces you create are then used in the three different games available in the app, including card matching, a Match-3 style game and a pattern match game. The app is bright and colourful and all the coding, artwork and music was produced by myself. It has been very well received and there have been over 40,000 downloads to date. Arthur & Charles also have their own website at http://www.arthurandcharles.com/. The app is Universal for iPhone, iPod and iPad. You can buy and downloaded it on the iTunes app store from this link. My "real job" has always been as a software developer. So when the iPhone was launched I naturally decided to sign up as an app developer. Putting my design and developer skills together, I produced a game for the iPhone / iPod Touch called Hiqup (released in September 2008). It was a game I'd had going round in my head for years and producing it for the iPhone allowed me to get it out of my system. Unfortunately the game is no longer available due to recent iOS updates. But, if time allows, I would like to produce a new version in the future. When launched, Hiqup was picked as featured app in the iTunes app store. 20 years gives you a lot of experience in software development. When I first started I was mainly using Basic and C on platforms such as the original IBM desktops (with the big floppy drives and not much hard drive space) and Amiga, although I had already been tinkering on the Vic 20, Commodore 64 and Spectrum for a long time. For the last 10 years I have mainly been a PHP developer, creating e-commerce systems and bespoke applications (the software running this site was designed and developed by myself and is available commercially). In 2008 I took the leap into iOS development and have been doing mobile development in one form or another ever since. I have mainly worked on my own projects, but more recently I've been working on projects for other clients (I generally cannot talk about those until they are released, however).